These are some of the frequently asked questions (FAQs) I get asked A LOT so I’ve answered them all in one place for you! If you don’t see your question or need something more specific, send me a message and I’ll get back to you as soon as I can. 1) I want to learn crochet but I’m having a hard time. Are there any resources or patterns you recommend for beginners? Yes! I’m so glad you want to learn how to crochet, and even though it seems tricky at first, you’ll get the hang of it. I put together a resource specifically for beginners that you might like to see. The Beginner’s Guide to Crochet has patterns, basic stitch tutorials, and videos of everything so you can follow along with me. And it’s free so grab it here. Or if you just want to go through the stitch tutorials, you can see those over in the Stitch Dictionary. 2) What yarn do you use and where do you get it? I try to include the name and type of yarn I used in each pattern, along with a link for where to find it online. Most of the acrylic I use is I Love this Yarn or Yarn Bee from Hobby Lobby. I usually buy my yarn at Joann Fabrics or Hobby Lobby, but I also like shopping online at Craftsy and KnitPicks. I have a whole post on how to buy yarn online along another post with some of my favorite yarns for different projects. 3) What crochet hooks do you use? I use my Knit Picks Rainbow Crochet Hooks and a few of the bulkier Clover hooks. I love the KnitPicks ones and you can read a full review of them here. I’m also saving up to get the Clover Amour set but I don’t need them yet. 4) Do you sell your finished work? YES! I take requests for finished items in my Etsy shop. Most things are made to order, but if you send me a message we can talk about having something made. I am working on building up a stock of some of my most popular items so check back often there. 5) Can I sell finished items made using your patterns? Yes, you can sell the finished pieces you make. I only ask that you credit me for the pattern and link back to www.theblueelephants.com or my Etsy shop. Do not reuse my pictures because it can be misleading to your buyers. Do not copy, modify or redistribute my patterns or printables in any way. I worked hard on those and I ask you to respect that. Thank you for understanding! 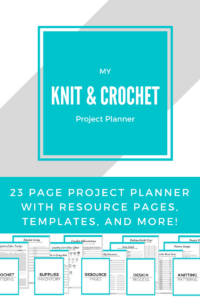 6) My project doesn’t look like yours! What did I do wrong and can you help me out? I can try my best to help you, but keep in mind that making something handmade means that every piece will be different and unique. My work may look different because I have more practice or because I hold my work differently from you. It’s not wrong, and you will get better. But if you need help or spot an error in the pattern, send me a picture and I can help you out! 7) Can I link back to your work on my blog or in a round-up? 8) I have an idea! Do you take requests/ can you design ________? I would love to hear your ideas! I may not have the time to design what you ask for but I can try. At the least, I can point you towards somewhere you can find that design. 9) How do you find ideas and inspiration? Most of my inspiration comes from what I have to work with, but I also get tons of ideas from others. I use Pinterest and Ravelry to see what trends are popular and what people are looking for, as well as Instagram. 10) Are your patterns in USA or UK terms? I use USA terms for all my crochet patterns because that’s how I learned. I have put together a cheat sheet to help you sort out the crochet abbreviations and convert between USA and UK terms. You can find that here. 11) Are there any knitting or crochet books you recommend? Yes! I love books and knitting/crochet ones are my favorite. I have a roundup of all my books and what I love about them. 12) I saw your post on how to soften acrylic yarn. Do you have to repeat this every time you wash or just the first time? Just the first time. In that post, I showed you how to treat scratchy acrylic yarn to be softer and you can use that process multiple times to get it softer and softer, but once is fine. After that, you can wash you garment as normal and it will stay soft. I like being able to soften cheaper acrylic yarn but there are so many acrylic yarns that are already very soft that I use instead now. The Yarn Bee Soft Secret from Hobby Lobby is my favorite. Some of my other favorite yarns are here. 13) Why do you sell PDFs of patterns when you have them for free on the blog? Blogging and designing is my full time job and I make most of my income through my patterns. Ads on the blog to help finance all the cost of materials and of owning a website so when you read a pattern here, I can give that to you for free and still be compensated through the ads. That’s why it’s so important for you to disable your adblocker for my blog and help me make that little bit of income. I can only do this because of the ads I run. I sell the PDF versions of all my patterns on Etsy because there are people who would rather not have ads in between the pattern. For a small fee, they can have that option and still support me and The Blue Elephants. Thank you for understanding and supporting me (and other small businesses)!